Texas House Speaker Joe Straus, a San Antonio Republican, announced Wednesday he will not run for re-election. He did not rule out running for higher office. Texas House Speaker Joe Straus, a San Antonio Republican, announced Wednesday he will not run for re-election in 2018, a decision that has the potential to upend the political balance of power in the state. Straus, who has lately been the most powerful moderate Republican in the Texas Capitol, said he will serve until the end of his term. That means there will be a new speaker when the Legislature next convenes in 2019. His decision immediately created a scrum for control of the House, pitting arch-conservative members who have opposed Straus against more centrist Republicans. Within hours of Straus' announcement, one of his top lieutenants, Rep. John Zerwas, R-Richmond, announced that he had filed to run for the speaker's post. State Rep. Phil King, R-Weatherford, had previously announced his candidacy, and others are expected to jump in. Straus has clashed with hard-line conservatives in recent years, not least Republican Lt. Gov. Dan Patrick. Tea Party leaders and their allies have blamed Straus for killing controversial measures backed by the far right, most notably a bill that would have regulated which bathrooms transgender Texans could use. "I believe that in a representative democracy, those who serve in public office should do so for a time, not for a lifetime. And so I want you to know that my family and I have decided that I will not run for re-election next year," Straus said in a campaign email. The announcement prompted gloating by Straus' critics and regret from his allies. Rep. Matt Schaefer, R-Tyler, who clashed with Straus as chairman of the House Freedom Caucus, tweeted, "It's morning in Texas again!" Straus ally Rep. Charlie Geren, R-Fort Worth, said, "I'm disappointed but I respect his decision." Gov. Greg Abbott, a Republican whom Straus has tussled with in recent months, thanked the speaker in a short statement. “Joe Straus has served with distinction for both the people in his district and for the Texas House of Representatives,” he said. And Rep. Chris Turner, D-Grand Prairie, chairman of the House Democratic Caucus, praised Straus for leading the way on a number of bipartisan initiatives, including improving access to state mental health services and public school accountability reform. "His deliberative approach to public policy will be truly missed, as will the inclusive manner in which he ran the House," Turner said. Speaking with reporters after the announcement inside his office, Straus said he finally took the advice he always gives members: After any session, go home and talk to your constituents and family, and then make a decision about whether to run again. “A confident leader knows it’s time to give it back,” Straus said. Asked if he planned to run for any other office in the future, Straus said he is “not one to close doors.” He acknowledged he has received encouragement to run for other offices and did not rule out the possibility of a gubernatorial bid. But he said he doubts he will be on the ballot in 2018. As for the race to succeed him as speaker, Straus suggested he would not get involved. 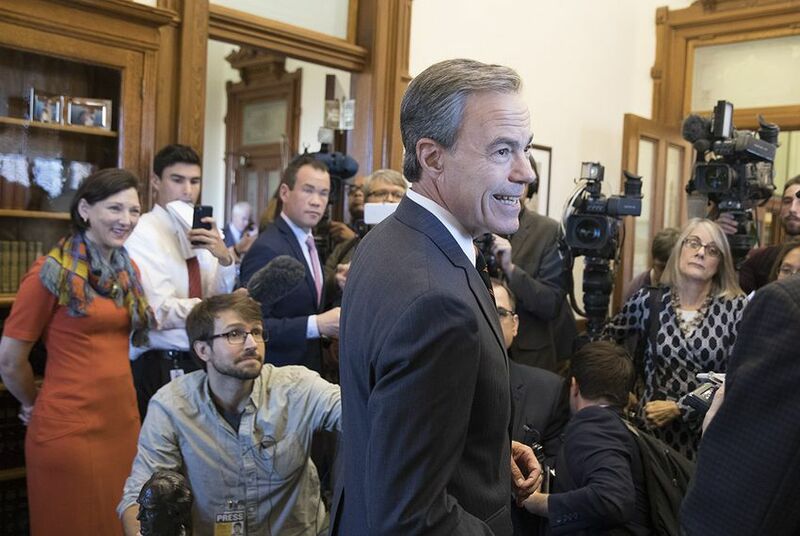 “I don’t think it’s appropriate for people who aren’t members in the Legislature in the next session to really register an opinion on that,” Straus said. The announcement that he won't run again immediately set into motion speculation about the future of Straus’ top lieutenants. One of his closest allies, Rep. Byron Cook, R-Corsicana, who is chairman of the House State Affairs Committee, said in a statement first reported by Quorum Report that he "will pursue other opportunities to serve our great state." If Straus had remained in office and won the speakership, it would have been for a record-breaking sixth term as leader of the chamber. He told supporters Wednesday that he never expected to hold the post. He was first elected to his House district in a 2005 special election. In 2009, he was elected speaker with the support of Democrats and a couple dozen Republicans who were frustrated with the ruling tactics of the speaker at the time, Rep. Tom Craddick, R-Midland. The circumstances of Straus’ rise caused many of the state’s staunchest conservatives to distrust him, but he held a firm grip on power for the next eight years. In 2015, he faced the first contested vote for House speaker since 1975 when Rep. Scott Turner, R-Frisco, challenged him. Straus prevailed in the 150-member chamber with all but 19 votes. This year, he was re-elected to the speakership unanimously, tying with Pete Laney and Gib Lewis for the longest tenures as speaker. During his time with the gavel, Straus mostly governed with a low profile. His public comments were rare, and he received more attention for the bills he blocked than the ones he championed. His legacy, Rice University political scientist Mark Jones said, will be the restraint he put on the Tea Party in Texas. "He slowed down, if not blocked, a shift to the right within Republican politics,” Jones said. His most public fight in recent years was over that bathroom bill, which was pushed by Patrick. Positioning himself as the guardian of the Texas business community that vehemently opposed the legislation, Straus was ultimately responsible for its demise. Citing dire economic and moral costs for Texas, Straus refused to consider bathroom restrictions proposed by Patrick. A stalemate over the issue set him and Patrick on a political collision course that played out in dueling press conferences featuring the two leaders trading blame for the breakdown of the session. The bathroom bill eventually fizzled out in the House. Straus’ handling of the bill and other hot-button issues prompted talk among conservative Republicans about replacing him. GOP members held a closed-door meeting in August to discuss rules about an impending 2019 speaker vote. But in the weeks and months following the bathroom fight, Straus appeared to be on a victory tour over the issue, urging business leaders to keep up the fight. "Texans rejected name-calling and scare tactics, and as a result, we avoided a major mistake that would’ve cost our economy greatly and divided us unnecessarily,” Straus said at a recent speech to the San Antonio Chamber of Commerce. "Now is not the time to walk away from the table. Going forward, working together we can do more than just avoiding mistakes." Morgan Smith, Patrick Svitek, Alexa Ura and Cassandra Pollock contributed to this report. Disclosure: Rice University has been a financial supporter of The Texas Tribune. A complete list of Tribune donors and sponsors is available here.